The bench has lids that lift up to give convenient access to the garbage and recycle cans from the back door and ground level. The doors open for easy removal so the cans can be rolled to the curb on collection day. The cans are only steps away from the kitchen but are completely hidden from sight in the garden. 4. Tuck Under a DeckIf your entryway is elevated, put the area under the deck to good use by enclosing it with wood siding and shed-style doors. This design by Land2c Landscape Architecture for a home in Seattle incorporates a bench seat at deck level that can be conveniently opened to drop garbage or recycling straight into the open bins concealed below. While only a few steps from the back door, the bins are completely concealed from view and easy to access. For under the new deck off the kitchen. Possible to locate garbage or recycle under East entry deck? 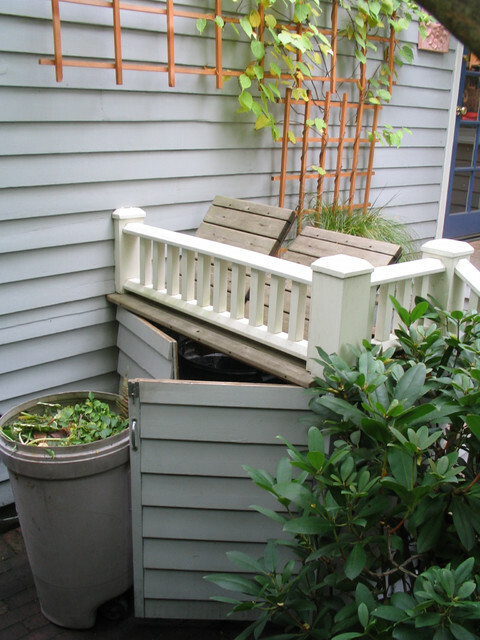 Tuck trash bins Under a Deck If your entryway is elevated, put the area under the deck to good use by enclosing it with wood siding and shed-style doors. This design by Land2c Landscape Architecture for a home in Seattle incorporates a bench seat at deck level that can be conveniently opened to drop garbage or recycling straight into the open bins concealed below. While only a few steps from the back door, the bins are completely concealed from view and easy to access.